Dr. Chris Taylor, a laparoscopic surgeon from Harrison, has performed more than 4,000 procedures, and he believes he has a tool, Ab Grab, to make future ones safer. To get that tool to market, he’s getting help from the Health InnovatAR accelerator program. His Fayetteville-based Lapovations was one of six health care startups, and the only one from Arkansas, to be awarded $50,000 grants from the program, which is managed by Winrock International. The winners were announced during a press conference Monday (June 4) at Arkansas Heart Hospital. The grants are being funded with the help of nine private investors. Meanwhile, Health InnovatAR’s administrative costs are being funded with a $250,000 grant from the Arkansas Economic Development Commission. The program will pair the grantees with Arkansas Heart Hospital, UAMS and BioVentures, a technology commercialization organization and startup incubator. The startups in the five-month program will work with the hospitals to test their products. They will have access to clinicians and administrators to do pilot projects, clinical trials and return on investment studies. The grantees are in Little Rock for three days this week developing a work plan for the next five months. Hundreds of applicants from 20 countries applied for the grants. Winrock International’s Jeff Stinson, who is the director of the program, said the grantees not only must have good products, but they also must meet the needs of those hospitals. Lapovations hopes to bring its Ab Grab product to market. It uses suction cups to lift the abdominal wall before instruments are inserted during laparoscopic surgery, a minimally invasive abdominal procedure. It accomplishes this using the wall suction that already exists in operating rooms. 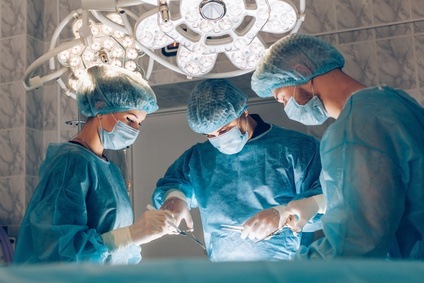 In an interview, co-founder Jared Greer said the most dangerous part of that type of surgery is the insertion of the instrument, usually through the belly button, because the surgeon cannot yet visualize the cavity and could accidentally pierce an organ. To create a gap and minimize the risk, the abdominal wall is manually lifted by being grabbed with towel rings or by hand, both inelegant procedures. According to Greer, lifting the wall by hand is unreliable and difficult to do with obese or very thin patients. Once the wall is lifted, the cavity is filled with carbon dioxide. The Ab Grab accomplishes this better by using suction to grab the wall, Greer said. Greer said Taylor approached him with the idea after the two worked together on another venture. The effort began in mid-2016, and the design has gone through several iterations. The current version is reliable and affordable, with an anticipated cost of $50 per surgery. Prototypes have been tested, but not in actual surgeries because they are not sterile. The $50,000 will help the company purchase injection mold tooling and manufacture an initial batch of 500 devices that can be sterilized and tested in the field. Through the InnovatAR program, the company will be testing and modifying the design in hopes of completing an initial test run this year and having a product on the market in early 2019. The six winners between them already have 46 full-time employees and have raised more than $15 million in extra capital. • Medical Informatics out of Houston, which helps medical personnel use patient data. Stinson said because the program is being funded in part with a state grant, it should benefit Arkansas-based startups. Seventeen other Arkansas-based companies applied for the program but weren’t selected. However, a parallel track is being created where the most promising of these will work with the two hospitals.